This summer started with a tour in Ukraine in June. July was empty with events, so that gave me extra time for planning autumn tour and working on new recordings. By the way two new tracks are already on soundcloud. August has quite many activities. 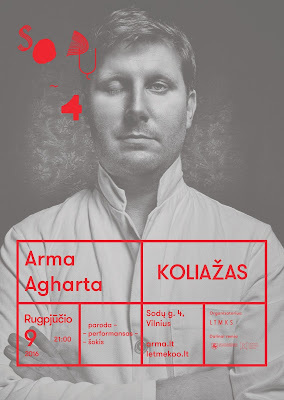 Firstly the special solo event was planned Vilnius, which will consist of exhibition, performance and dance at the space Sodų 4. This is announced already and currently all my thoughts are abour this. Also suddenly I've got two invitations two perform in open air festivals in Lithuania. This is quite a surprise! So, 6th of August - Ont Grindų - the festival of extreme guitar and drums based music, gonna do some fun there and 13th of August - ASAP - the event organized by STRCamp crew, so I expect some interesting music there and good crowd. More.. in the second part of August I will take part in the artist residency (first one ever!) in the center of Lithuania, Raseiniai district. Together with some other artists we will be producing an absurd operetta, which we gonna show in Raseiniai contemporary art festival in the end of the summer.